In January the University of Alabama started Saving Lives, a faith-based partnership to increase health literacy and to support residents in rural and urban Alabama in attaining higher levels of health and wellness through the use of prudent health practices and scripture. In addition to using theologically sound doctrine to support health care information and recommendations, the program helps area churches facilitate workshops on topics such as talking to your doctor, weight management, being familiar with and understanding medications, preventing and managing diabetes, and cooking healthy nutritional meals. The Rev. Richard L. Morgan, pastor of First African Baptist Church in Tuscaloosa, said he is pleased to offer the program to his congregation. First African Baptist pastor, the Rev. 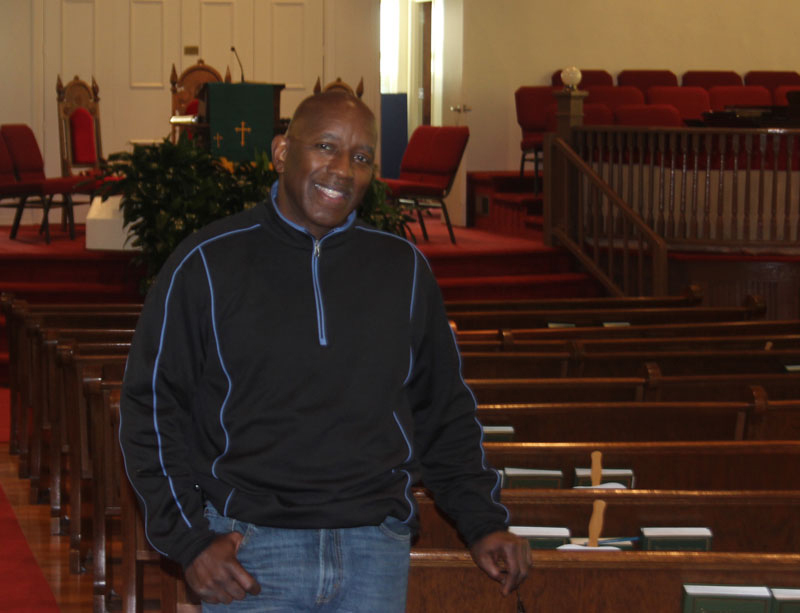 Richard L. Morgan, stands in the sanctuary of his church, which is one of three Tuscaloosa churches participating in a pilot faith-based health program. The university purposely selected a scripture-based approach because of its compatibility with the existing religious and cultural norms of the state and nation. The initial pilot audience includes leaders and members in Tuscaloosa African American churches. For Morgan's congregation of 500 people, he decided to use participation as a guide to measure the successfulness of the program. So far, his expectations have been met. So far, First African has focused on reaching its members. However, Morgan said once they incorporate the information into its outreach ministry, his church will take the Saving Lives message to community centers and housing developments throughout the community. "We're going to start to incorporate the program into our outreach ministry," said Morgan, adding that his congregation conducts monthly community outreach as an attempt to reach non-members. This is exactly the kind of snowball effect that UA Vice President for Community Affairs Dr. Samory T. Pruitt hoped would occur when he envisioned the Saving Lives program. "UA researchers and local pastors believe a combination of faith-based practices in collaboration with outreach and engagement scholarship strategies can contribute to an improvement in the overall health of Alabamians, reducing the risk of diseases such as hypertension, diabetes, hearth disease, cancer and stroke," said Pruitt. The program will attempt to shed light on health care challenges facing 62 million rural citizens in the United States and the 2 million Alabamians who are dealing with a variety of health care and health insurance problems. 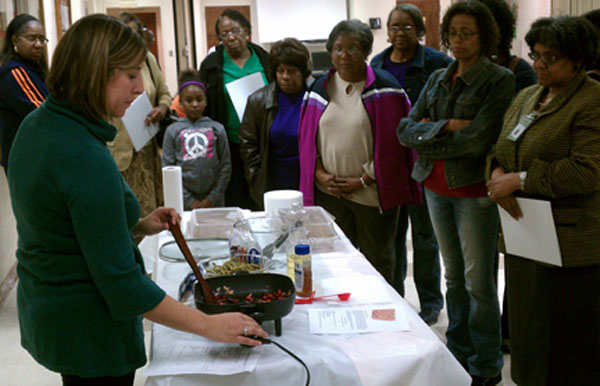 Ms. Tera Glenn, of Alabama Cooperative Extensions, demonstrates a healthy recipe option for members of First African Baptist Church. Already, Morgan sees how the information is assisting his congregation, especially those battling high blood pressure, diabetes, kidney disease, cancer, obesity and illnesses common to African Americans. The goal of the program is to reach as many churches and congregations as possible by providing them with a curriculum and the tools necessary to spread the word about health living. Christopher Spencer, director of Community Development for the Center for Community-Based Partnerships, hopes that by starting with First African Baptist, College Hill Baptist, and Plum Grove Baptist, UA will gain insight into how best to expand the program into additional congregations. "Researchers will utilize the best practices from the first three churches to develop a strategic plan to include other ethnic, religious and geographic groups to include congregational members from synagogues, mosques and diverse faith-based organizations located in Alabama and across the nation," Spencer said. Morgan believe the program has great potential for expansion, but thinks the program will work best for congregations led by forward-thinking ministers with outreach and teaching philosophies. "This program will give church leaders and university researchers an opportunity to complete the assessment on the pilot churches and to make any necessary adjustments prior to implementing the initiatives in rural communities," Pruitt said.